Taste test: This package contained eight mini candy bars, each of them about two bites. The texture was chewy, and I couldn't really taste a whole lot of chocolate, but I could taste the salty peanuts. This "Original" variety was less sweet than the "Milk Chocolatey" version of Chew-ets, as this had its own taste identity, while the "Milk Chocolatey" one was a lot like Snickers. If you're in it just for the peanuts and chewiness, this might be a good choice, it didn't deliver much in the way of chocolate. Smell test: Very mild chocolatey smell. 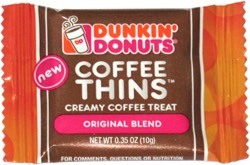 This snack was discovered by Jeremy at Ann & Hope Dollar Store, Dartmouth, Massachusetts. Review published .